LaLD Car Week - French Thursday on the Thames: Champion du Monde! This one really is a mash-up of brands. It was meant to be a model for the English car brand Sunbeam but actually started it’s life as a Chrysler Sunbeam. And ended up winning the 1981 World Rally Championship for French company Talbot. Wait. What? Some might recognize the Talbot Horizon in this one but that’s just the looks. As Chrysler Europe got funding from the British government to develop a new compact car it had to use as many British parts as possible. And although Chrysler Europe had enough modern platforms to choose from (Simca was part of Chrysler Europe as well!) they started their design by re-using the platform of the Hillman Avenger. A car already outdated when introduced. In 1970. But the Avenger had one great feature for rallying: RWD. And with a smaller body on it it looked quite modern actually. There was a sporty TI which came with a 1600cc twin carburetted engine putting out slightly over 100hp. In combination with the RWD lay-out this was quite fun but still no world shattering performance. So they (still: Chrysler Europe) called a small company from Hethel. You probably recognize that logo in the striping: Lotus. They increased their first own production engine (907) from 1973cc to 2172cc which helped it getting better torque (but top power delivered at lower rpms). For road use 152hp was available but in rally trim this was way more: over 250hp. The Sunbeam Lotus was introduced in April 1979. But... Chrysler Europe was already sold to PSA (Peugeot) in 1978 for 1 US Dollar. So there was no room anymore for a sub-brand and therefor the car was, when it arrived at the dealerships, rebranded as... Talbot. One of the three main brands of PSA (Peugeot, Citroën and Talbot). It was, for road use, available only in black with a grey striping on the side with the Lotus logo incorporated. In 1982 though, with a number of cars still in stock and sales slow, Moonstone Blue paintwork became the only available colour. Customers were offered a choice of silver or black stripes. And that’s the one you see here: An ‘82 with black striping. Chrysler’s initial ambitions were for a run of 4500 engines, but Talbot claim a total of 2308 cars produced. Lotus, partly responsible for producing the cars, claim 10 cars less but the difference could be some ‘works’ rally cars built from bare shells, not going the Lotus route. The homologation was debatable, as many homologations were these days. This was done April 1st 1979 on the basis of 32 pre-production cars converted by the Service Department: these filled the factory’s service workshops and gave the right impression of progress to the FIA delegates at a time when production cars were not quite ready to roll off the lines. True April fools! In the WRC it was quite successful. But it didn’t really won a lot of races: in the 1981 season 1 win, 5 2nd and 1 3rd place were enough to secure the World Championship. Most of the time in the hands of Guy Fréquelin, a guy few of you will know. His co-driver though is well known: Jean Todt. After this the 4WD took over the world of rallying, although Lancia won the WRC championship one more time with a RWD 037 in 1983. 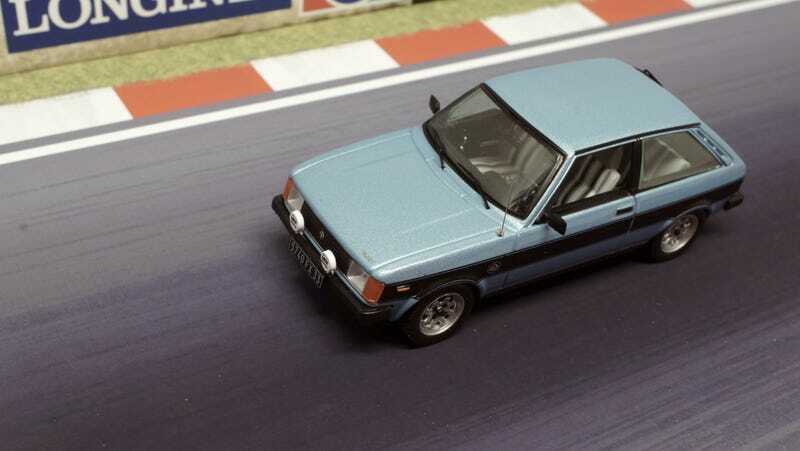 At the end of the 1982 season many of the Talbot team transferred to Paris where their experience contributed to the success of Peugeot-Talbot’s new Group B monster, the 205 T16. There were plans though to make a Group B successor for this one, a mid-engined, turbo-charged Lotus Horizon, of which only one example was built before attention was switched to the 205. The model is a 1/43 from IXO. They can be had for around 20 euros. There’s a black Phase I available as well, that one has the smaller headlights. It’s quite sturdy although I fear the antenna could break off eventually. It rolls like a champ. It comes with the typical IXO box/base. Already a bit tilted so excellent for display in the box. I certainy would recommend IXO if one was going to try some 1/43's. That’s it for today. Still not sure what to do for tomorrow’s French Friday. LaLD Car Week this far has been awesome, can’t wait to see what you’re all showing today. Bye bye!